Earlier, State Department spokeswoman Heather Nauert said that some 230 million dollars in US stabilization funds for Syria will be redirected "to support other key foreign policy priorities." In one of his latest tweets, President Donald Trump has announced that the United States has halted the "ridiculous" 230-million-dollar annual payment to Syria. 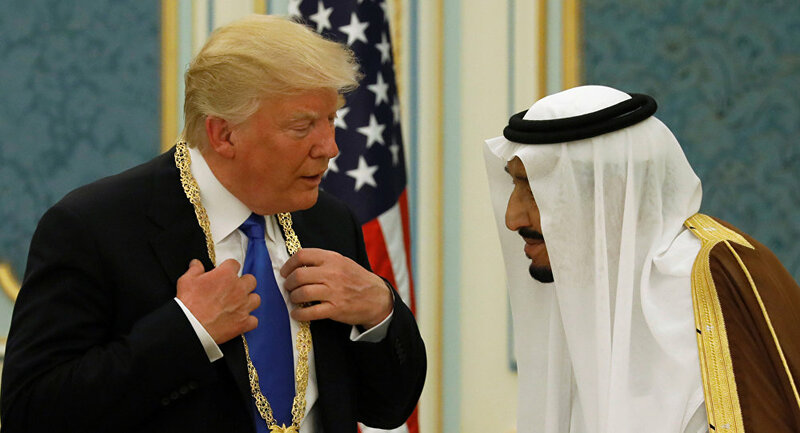 "Saudi Arabia and other rich countries in the Middle East will start making payments instead of the US," Trump tweeted, signaling his readiness to develop the country's military. His remarks came a few days after State Department spokeswoman Heather Nauert said in a statement that "as a result of key partner contributions by coalition members, Secretary [of State Mike] Pompeo has authorized the Department of State to redirect approximately $230 million in stabilization funds for Syria, which have been under review." According to her, the cut will be more than offset by an additional 300 million dollars pledged by Washington's coalition partners. They include Saudi Arabia and the United Arab Emirates, which contributed 100 million dollars and 50 million dollars, respectively. Nauert also pledged that the US "will continue to provide life-saving, needs-based humanitarian assistance to vulnerable Syrians, support for the White Helmets and the UN’s International Impartial and Independent Mechanism to hold [Syrian President Bashar] Assad's regime accountable for serious crimes, as well as equipment and other measures to counter the effects of chemical weapons in northwest Syria." Earlier this year, media reports said that the Trump administration seeks to build up an Arab army to replace US troops in Syria. According to the Wall Street Journal, the White House is considering involving Saudi Arabia, Qatar and the United Arab Emirates (UAE). Earlier in August, Russian Foreign Ministry spokeswoman Maria Zakharova described participation of the United Nations High Commissioner for Refugees (UNHCR) in the evacuation of the White Helmets from Syria as "a big mistake." She added that the White Helmets NGO collaborates with "terrorist groups" in order to slander anti-terror activities in the country. Zakharova spoke after up to 800 White Helmets and their family members were evacuated from Syria by Israeli authorities at the request of Canada and several European countries as well as the US last month amid the Syrian Army's offensive against militants in Syria's south part. Damascus slammed the evacuation as a "criminal operation." The White Helmets has repeatedly claimed that its fundamental aim is to rescue civilians in war zones, however, it has been accused of establishing links to jihadists and helping them to fight the Syrian government. In April, Russia and Syria stated that the group was responsible for staging the alleged chemical attack in the city of Douma, which triggered airstrikes against Syria, carried out by the US, Britain and France. The international community has voiced concerns about the use of chemical weapons inside of Syria since the alleged use of sarin gas in Damascus in 2013. Following the incident, Syria joined the Organization for the Prohibition of Chemical Weapons (OPCW) and agreed to destroy its chemical weapons arsenal. On January 4, 2016, the OPCW issued a statement to confirm that the destruction of the Syrian chemical weapons had been completed.